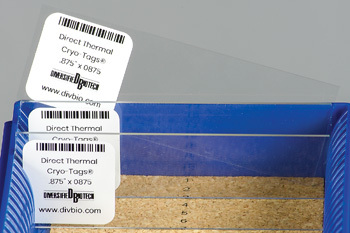 Direct Thermal Cryo-Tags® are formatted to easily work with the Dymo® Labelwriter®. Quickly label your samples with sharp text, clear barcodes or a combination of both! Once downloaded, unzip to an easy-to-find location and open with Dymo Software. Important note for International Customers: Our Direct Thermal labels are designed to work with U.S. Model Dymo printers only. U.S. Dymo printers may be available in your area; please contact sales@divbio.com for more information.